Protector latex examination gloves have an enhanced textured surface to provide excellent touch sensitivity and grip, which is ideal when working with fluids and instruments. The internal powdered surface makes them easy to don, whilst the textured external surface provides an increased sensitivity and grip that is ideal when working with fluids, instruments or glassware. Prestige powder free Nitrile examination gloves with strong beaded cuffs are as soft, supple and comfortable to wear as natural rubber latex but they are significantly stronger and have superior resistance to oil/chemical permeation. These gloves contain no natural rubber latex, no protein or powder, eliminating the risks of powder induced contamination and skin allergies. Prestige soft vinyl examination gloves contain no latex proteins or chemical accelerators which can cause allergic skin reactions. 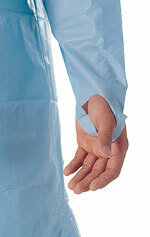 Softer and more flexible than standard vinyl gloves, they are standard cuff length and ambidextrous. Premier® Prestige powder free latex examination gloves provide outstanding protection with strength, sensitivity and dexterity. The textured surface provides superior grip and unlike some power free gloves they are easy to don. they are standard cuff length and ambidextrous. 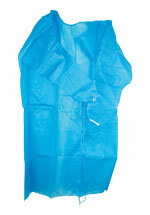 Ideal for all sterile procedures and in a broad range of applications where personal protection is required. 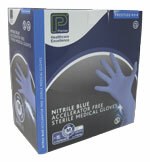 Prestige sterile nitrile powder free examination gloves, with strong beaded cuffs are as soft, supple and comfortable to wear as natural rubber latex but they are significantly stronger and have superior resistance to oil/chemical permeation. 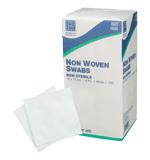 Non-woven swabs made from a viscose/polyester material. Soft, gentle, virtually lint free swabs that provide strength and durability. The close knit weave of fabric provides excellent wound release with no snagging on sutures or wound debris. Manufactured to comply with the Drug Tariff Technical Specification 28. Soft gentle, virtually lint free non-woven swabs that provide strength and durability. Close knit weave of fabric provides excellent wound release with no snagging on sutures or wound debris. Manufactured to comply with the Drug Tariff Technical Specification 28. 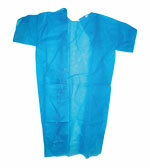 Large opening peel pouch lip enables easy opening and safe presentation of sterile products. 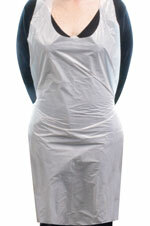 Light weight examination gowns manufactured from a soft, heavy gauge, non-woven polypropylene material, with elasticated cuffs. Oversleeves provide simple yet effective protection of the wrist and forearm when worn with gloves. Covers from cuff to elbow and elasticated at both ends. Manufactured from embossed cast polythene material, making them soft, lightweight and durable. Overshoes have an elasticated top for a snug and comfortable fit. 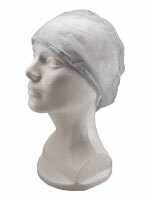 Disposable elasticated white nurses caps made from soft, breathable, spun-bound, non-woven polypropylene material with elasticated back. Disposable blue latex-free theatre caps with ties made from soft, lightweight, breathable, spun-bond, non-woven, polypropylene material. Pillowcases with inner flap, are manufactured from soft, flame retardant non-woven material, providing comfortable hygienic, and cost effective bedding. Ideal for use in all areas where short stays or frequent bedding changes are required or where laundering is problematic. Manufactured from soft, flame retardant non-woven material, providing comfortable, hygienic and cost effective bedding. Polythene mattress cover, manufactured from a soft and durable lightweight blue polythene material, with boxed corners elasticated all round to ensure a secure fit. Economical and effective method of protecting the mattress against soiling. A general purpose receptacle, designed for a multitude of functions such as holding a variety of medical items including dressings, wipes or surgical instruments. Also suitable for ear syringing. Manufactured from paper pulp, they are environmentally friendly and easily disposed of via a macerator or with clinical waste. 900ml Capacity & strong sides to support weight when full. 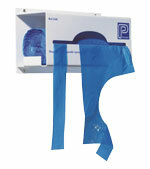 Self-sealing sterilisation pouches feature a double adhesive strip seal for added safety and security of the contents. PremierPad™ is a closed end highly absorbent wound pad manufactured from soft, low-linting, non-woven material with cellulose wadding. PremierPad™ is extra absorbent and suitable for use in a range of wound care settings where high, evenly distributed fluid absorption is required. Recommended for post-operative and community care.